Tee-pad Hole 16 Pye Brook. This is prior to trimming the edge and screwing the mat down to the frame. A few days ago I read this post on the NEFA forum. It’s written by Jason Southwick, a guy who’s probably put more time in working on courses than I’ve played on them. It’s a recipe on how to build great tee-pads. It’s also kinda funny. As a course is being put together, the tee-pads tend to be last on the “To Do” list, and often enough they’re treated as an after thought. A course needs a layout. A course needs baskets (although, some object courses can be really fun- like the ones that hang old oxygen tank halves that make a satisfying “GONG” sound when you finish a hole!). And finally a course needs tee-pads. Oddly enough, conversly, when you visit a course for the first time, the tee-pad is the first thing you see and physically interact with. How frustrating is it play a course hours after it’s rained, yet there are still puddles inches deep on the tee-pads? How hard is it to throw a pinpoint accurate drive when you’re trying to avoid giant divots in the dirt? It’s not a great first impression, but can be a lasting one. People often tell me it’s no use complaining unless I intend on doing the work myself. I actually agree with this- since nobody appreciates a whiner. However, I don’t think being complacent is exactly a valiant alternative. 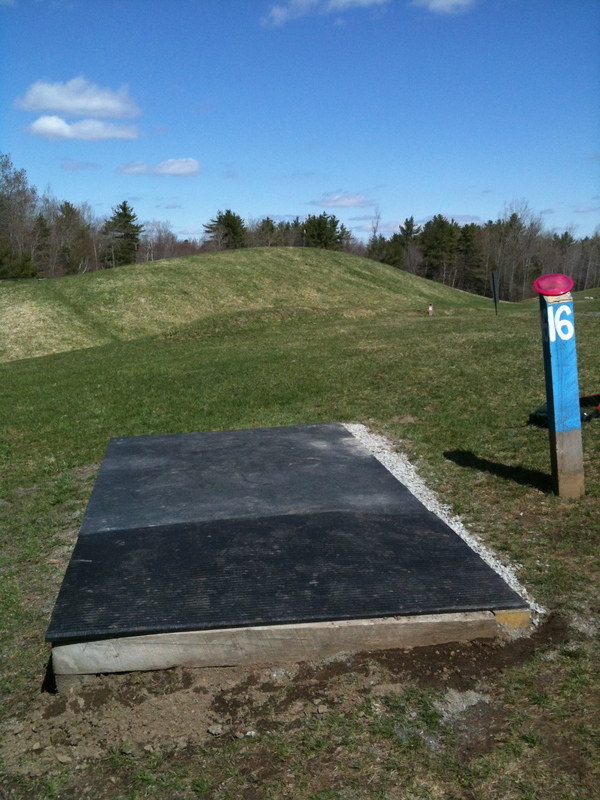 This entry was posted in Equipment and Gear and tagged course, disc, golf, pad, tee, teepad. Bookmark the permalink.